ACCORDING TO Deloitte, Stoke City are among the top 30 football clubs, bigger than the likes of Ajax Amsterdam, four times European champions. Of course, this is attributable to the remarkable level of wealth that exists in the English Premier League rather than Stoke’s success on the field of play. Although one of the founding members of the Football League in 1888 – they finished bottom in the 12-team competition – Stoke have never been champions of England. The closest they came, until the mid-1970s, was in 1946-47 when they finished fourth. Yet Stoke, down the years, have fielded some richly talented players, including Stanley Matthews, Neil Franklin, Jimmy McIlroy and Gordon Banks. Very much the team of the Potteries, as synonymous with the region as Arnold Bennett’s Anna of the Five Towns, Stoke City have arguably been one of football’s under-achievers, but they have always been very much part of the fabric of the game’s industrial heartland. They may have been indelibly linked to pottery, but they have never been associated with gold or silver. Look at Stoke’s honours list and it will not take long to absorb. The only major prize has been the Football League Cup, won in 1971-72 against the odds. Nobody expected Stoke to win the trophy that year, more so when they lost the first leg of the semi-final at home to West Ham, but after a marathon tie, they won through to the final. Their opponents, Chelsea, had been in good form since overcoming a poor start to 1971-72. Chelsea had won the FA Cup and European Cup-Winners Cup in the two previous campaigns and the pundits anticipated a hat-trick of triumphs. Furthermore, Stoke had a few players who were approaching the veteran stage of their careers, including Banks, George Eastham, the pipe-smoking Peter Dobing and John Ritchie. On paper, it looked a foregone conclusion that Chelsea would win. The game started dramatically with Terry Conroy putting Stoke ahead and although Chelsea levelled and began to dominate, Eastham snatched the winner for Tony Waddington’s side. Stoke were ecstatic but despite reaching the FA Cup semi-final, losing for the second successive season to Arsenal at the penultimate stage, their league form deteriorated and they won just once in their last 13 games. 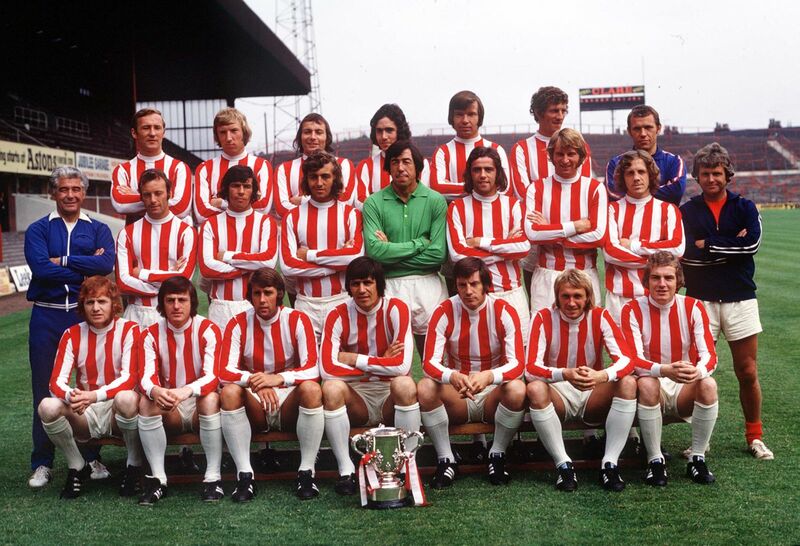 There was little sign that Stoke would build on their 1972 success in 1972-73. Mike Bernard, one of the younger members of the Wembley team, was sold to Everton for £160,000 and in his place came two strikers: England World Cup hero Geoff Hurst from West Ham and Jimmy Robertson from Ipswich Town. The success of 1972 and the arrival of Hurst helped boost season ticket sales, but the campaign started poorly, with one win in the first nine games. Then in October, the club and the nation suffered a major setback when Gordon Banks was involved in a serious car accident. Banks lost an eye and eventually gave up the game. Stoke finished the season in 15th place. While players like Dobing and Eastham had now gone, along with Banks, the bulk of the team that beat Chelsea was still intact. Waddington knew, midway through the 1973-74 season, that he needed to strengthen his squad. In January 1974, he made a bold bid to bring two highly talented players, Peter Osgood and Alan Hudson, from Chelsea to the Midlands. Both had fallen out with Chelsea and their spat with manager Dave Sexton had dominated the back pages of the national press. Waddington persuaded Hudson to join Stoke, paying £ 240,000 to the London club for his services. He was not able to make it a double coup as Osgood opted to join Southampton. Hudson was still only 22 years old, so his best days were ahead of him. He had long been considered a potential star of the 1974 World Cup, but after shunning his country when called-up for an England Under-23 tour in 1972, he had little opportunity to shine on the international stage. When Hudson made his debut for Stoke, his new club was 17th in the table. He made his debut against Liverpool earning glowing praise from Bill Shankly, who called it, “the best debut I have ever seen”. Hudson’s ability was never questioned, in fact, he had been compared to West Germany’s rampant Gunter Netzer, but his attitude was always an issue. But at Stoke, away from the distractions of the Kings Road in London, Hudson flourished. People started to call for his inclusion in the England team, which had lost out on appearing in the 1974 World Cup. Meanwhile, Stoke lost just twice in their last 18 games and were unbeaten in the final nine. Hudson even rubbed salt in Chelsea’s wounds in a dreadful season, scoring the only goal in Stoke’s 1-0 win in April at Stamford Bridge. Waddington, with Hudson at the heart of things, tried to build a team that played a more cerebral style, one that played homage to the scintillating “total football” of the early 1970s. Hudson was certainly cut from the same cloth as some of the Dutch and German players of the period and this was underlined when the former Chelsea man made his debut for England in 1974-75. Sir Alf Ramsey was never convinced about Hudson, despite naming him in the preliminary 40 for World Cup 1970 as an 18 year-old. Injury kept him out of Chelsea’s FA Cup winning team and that seemed to affect him in the following year. Don Revie finally selected Hudson for the England v West Germany game at Wembley in March 1975 and he had an inspired game, drawing praise from none other than German skipper Franz Beckenbauer, who could not believe that England had not used Hudson more often. But he made just one more appearance, a 5-0 win against Cyprus, before being discarded by Revie. 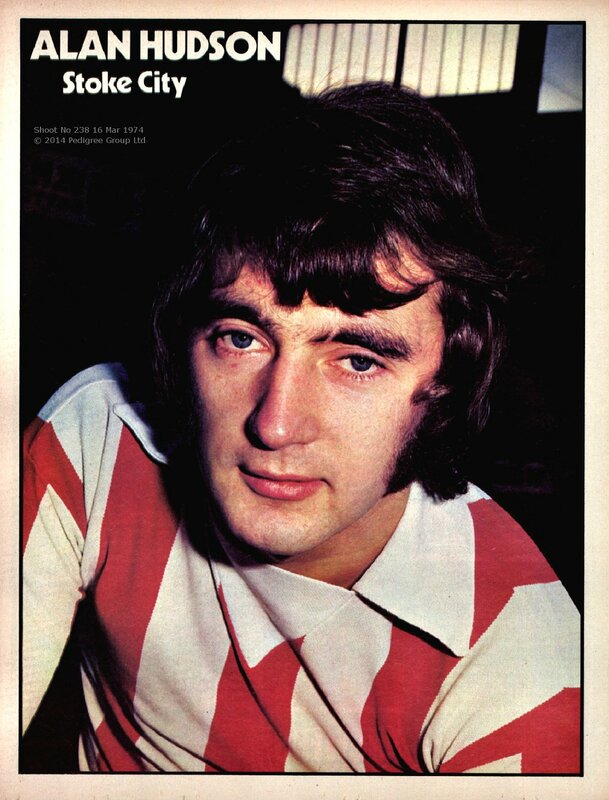 Stoke were going great guns in the league in 1974-75, starting with a 3-0 win against Brian Clough’s ill-fated Leeds United on the opening day. Jimmy Greenhoff benefitted enormously from Hudson’s pinpoint passing and eventually scored 14 goals in the league, and the old warhorse, Geoff Hurst, had a final flourish up front. Stoke were also boosted by the arrival of Geoff Salmons from Sheffield United. Waddington then made another somewhat audacious capture when he signed Peter Shilton from Leicester City in November for £ 325,000 – a world record for a goalkeeper at that time. Within 10 days of Shilton’s arrival, Stoke hit the top of the league following a 1-0 win against his former employers. For a club that was distinctly a budget-price shopper, the acquisition of Hudson and Shilton gave the Potters a new, are we say, glamorous image, and what’s more, the quality of their football was worth watching. The 1974-75 title race was a tight affair, however, and three successive defeats, culminating in a 0-2 defeat at Coventry on Boxing Day, sent Stoke down to seventh place. By mid-February, they were back on top, but there were so many contenders, including unlikely pretenders like Burnley and Middlesbrough, that nobody could really predict how the season would end. The lead at the top changed something like 22 times. At the end of March, after beating fellow aspirants Liverpool 2-0, Stoke were one point behind leaders Everton and sat in third place. A week later, after a resounding 3-0 win against Chelsea, there were four teams on 47 points with Stoke in third. But then they either lost their nerve or ran out of steam. Stoke failed to win any of their last three games, starting with a 0-2 defeat at Sheffield United that sent them down to fifth position. Two goalless draws ensured they stayed in that position in the final analysis, but they were only four points off winning the. If Stoke had won their last three games, they would have been champions. Sadly, it all turned to dust. Stoke dropped to mid-table in 1975-76 and then damage to their ground required money they struggled to find. As a result a string of players departed in 1976-77 – 30 year-old Jimmy Greenhoff left for Manchester United in November 1976 for £120,000; Hudson exited in December 1976 for Arsenal (£200,000); England full-back Mike Pejic defected to Everton (£ 135,000); and Sean Haslegrave and Ian Moores also departed. In March 1977, Waddington left Stoke City and a couple of months later, the club was relegated from Division One. Stoke may now be firmly established in the Premier League and the top 30 of the Money Football League, but they may never come as close to winning the top honours as they did under Tony Waddington and with Alan Hudson and Peter Shilton in their ranks. Halcyon days in the Potteries.